At the recent NFDA convention in Chicago I attended six different seminars. There were several that had different titles but talked about the same stuff. Mike Turkiewicz from Funernet and Lynn Elliot from Media Demographics both gave good presentations that talked about what’s ahead as far as advertising and the internet. They both talked about the importance of having a presence on social media (Facebook and LinkedIn. And they both talked about making sure your web site is mobile friendly because many people will need to access your information from their cell phone and it’s important to make it easy for them to see the info they need. They also talked about Google ranking and Google place pages. I recently read/listened to a couple books about Google and I am positive that for the next few years Google will be leading people to our doorstep more than any other advertising media. And that promoting reviews of your funeral home and making sure all your info is up to date and interesting for viewers will be very important to getting your message out to the public. In fact I had a challenge a week ago where someone informed Google that my main branch was closed and no longer operating. Google had taken me off their Places list and when I googled “funeral homes Muskegon, MI” my funeral home wasn’t showing up at all. I did some further investigating and found out what had happened, but not how it happened. I went in and updated my places page and magically my funeral home reappeared, and this time at the top of the list. So now I have been checking it weekly to make sure it hasn’t disappeared again. Mike spoke of a client of his who was pretty sure a competitor had done the same thing to him. There wasn’t any way to prove it concretely but all sorts of signs led to that conclusion. I listened to a talk by Jim McCann from 1-800-Flowers. He gave a two hour presentation where he told how he got started in his business and how he was growing it. Obviously funerals and flower shops have a symbiotic relationship but I didn’t realize that they also had a website called celebrations.com that covered any kind of event. This site not only sells flowers but gifts and cards and gives planning advice for all kinds of events including funerals and memorial gatherings. While some people may think that this is just an FTD type connection to flower shops, 1-800-flowers is branding local flower shops with their name and training the owners how to better serve their customers on a personal basis in addition to offering more and better products. It was clear me that their methods could easily be transferred to the funeral business. And I’m guessing that Jim McCann is thinking that too. It’s not hard to think that a funeral industry outsider, like him, could look at our business in a different way, with much better marketing experience and figure out how to start a national brand of funeral service that serves the ever changing wishes of the public better than the current funeral industry does. When I suggested this possibility at a roundtable meeting with other funeral directors last week they all scoffed at me. They said that a national chain of funeral homes could never duplicate their service to the special nuances of their communities and local culture. I’m guessing that’s what the local pharmacies and hardware stores said about Rite Aid and Home Depot too. I also got a chance to listen to Doug Gober give a great talk about where he thought funeral service needed go in the future. Doug has been in the funeral industry for over 25 years with York, Carriage Services and now with Live Oak Bank. Part of his talk revolved around his own mother’s recent funeral service. He told about the folder they created that contained the written story of her life and photos that they passed out to people why they were waiting in the receiving line. They also video taped interviews with several special people and then edited those interviews down to 8 minutes for the church service the following day. It was quite impressive, albeit Doug had special help from experienced video folks who stayed up till the wee hours making all that happen. The lesson here was that it was the stories that the people told of Doug’s Mom that made the service so special. Stories in print, in person and on video. Doug also included this video of a memorial service in Singapore. It was produced by the Singapore Government promoting the importance of family. It’s a great example of stories at a service and how important they are. Watch it, you’ll be glad you did. Overall I thought the seminars were good and well organized. It’s always unfortunate that there are only so many hours in the day and that some of the seminars I want to go to are scheduled at the same time so I have to choose. 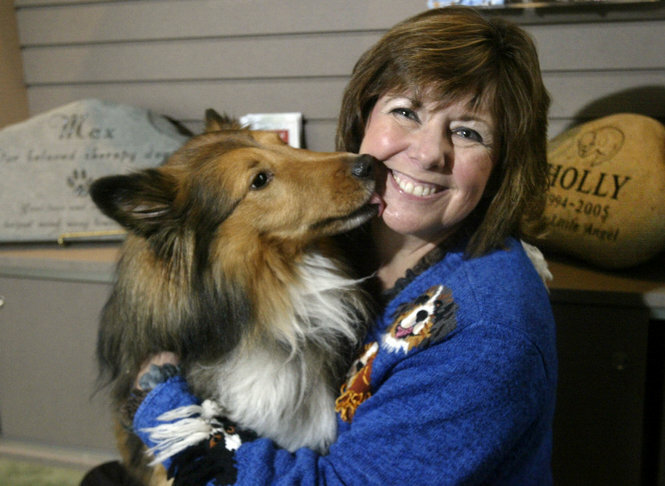 The Muskegon Chronicle, our local newspaper, did a great article today on my wife Jodi and her pet cremation business, Clock Timeless Pets. Here is a link to the article , more photos and a video of Jodi talking about the services Timeless Pets offers. Here is a Photo of Jodi and Ernie , our therapy dog. Ernie works at the funeral home everyday. He is there to meet and greet guests who come for visitations and funerals. Ernie is 5 years old and has been with us at the funeral home since he was a pup. When Jodi first suggested we have a therapy dog at the funeral home I was a little leary. But for the last 7 years now, first with Max and then Ernie, I can’t imagine our funeral home without a therapy dog. My fellow Life Story Funeral Director Matt Hollebeek from Heritage Life Story Funeral Homes in Grand Rapids, MI passed this story on about a family he took care of a few months ago. “We handled the arrangements and life story but I thought you would find her “tribute” video on youtube interesting, I sure did. Here is a link to her mom’s life story and her life story digital film. And just so you know . . . all of us connected with the Life Story Network feel we are transforming funeral service . . . because we make it about the human connection, about how we are all forever changed by the stories of the people whose lives touch ours. Below is a link to a story on our local news channel, WZZM. It is about a young girl who lost her mother to suicide. The NFDA/CANA Convention in Chicago wrapped up on October 26th. I was there for 4 days and attended as much as I could during that time. Here’s my take on the event as a whole. The Convention Floor and vendors – The layout was good and easy to navigate. There were lots to see but not a whole lot in new stuff that I was interested in. Hearses and Limo’s aren’t that important to my business anymore because with a cremation rate over 60% we rarely go in procession to the cemetery anymore, so I didn’t look at any of them. There were at several dozen suppliers of cremation urns. Many were very interesting but rather pricey and unfortunately my market doesn’t really go for that kind of thing. 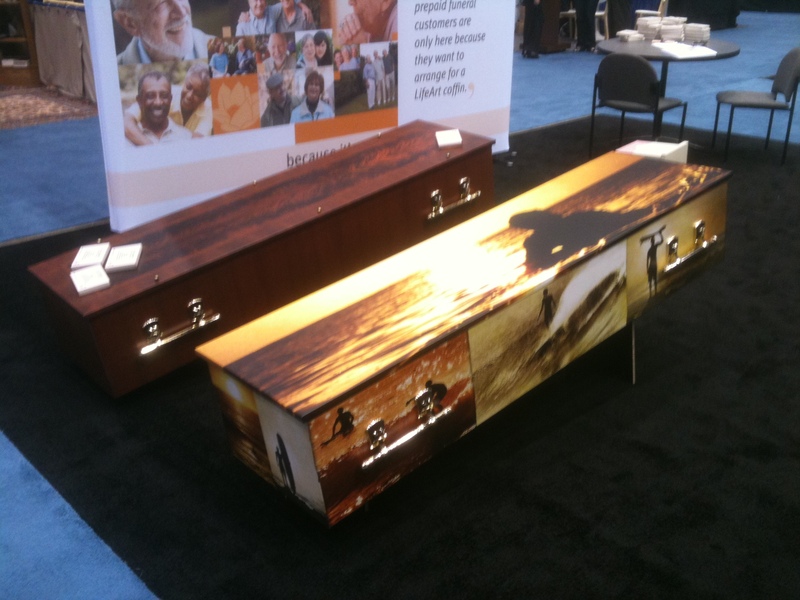 The big casket suppliers all had great displays and good looking products. It all comes down to price, delivery and presentation though. Can they deliver the product when I need it and can they help me present the product to the customer? Each has their plus points as they try to figure out how to influence the Funeral Director. There were the off beat casket folks that seem to attract the attention of the press but are rarely there for more than a few years. Here are a few pictures. 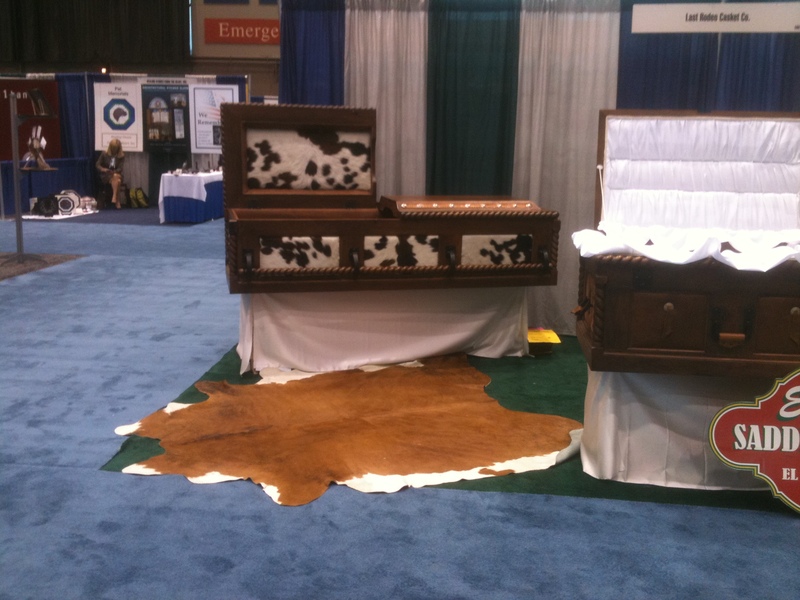 I’ve seen stuff like this before; pictures on the caskets, Wicker caskets for green burials, odd shaped caskets, cowboy themed, camouflage interiors, just to name a few. We tried a few out a number of years ago and people would look at them on our floor and say that’s cool, but then choose a traditional design. So we never got any more. There were a number of cremation jewelry folks who had some nice stuff at affordable prices that I think can meet some of my client’s needs. We just need to make better displays in my funeral home so the public can see what’s available. Then there are the folks who are sure they have created the greatest thing ever to hit funeral service. They’ve never presented at a convention and they get stuck in the far reaches of the floor with a simple booth and don’t really know how to talk to folks. I try to stop by and let them give me their pitch just on the rare chance that they may have hit on something. But usually it’s something that’s not that unique or that I’ve already been doing. This year there were several folks who were doing digital register book kiosks. They did some nice work on the software and touchscreens but I’ve had computer kiosks in my lobby for 3 years whose guests book are already integrated with custom register books. This year’s NFDA technology winner was a digital sign for the lobby. It was nice but pricey. And it seems to me that a wall mounted 32 inch flatscreen TV with a USB port and a flash drive loaded with a few graphics that rotate as a slide show will do the same thing for about $300.00. 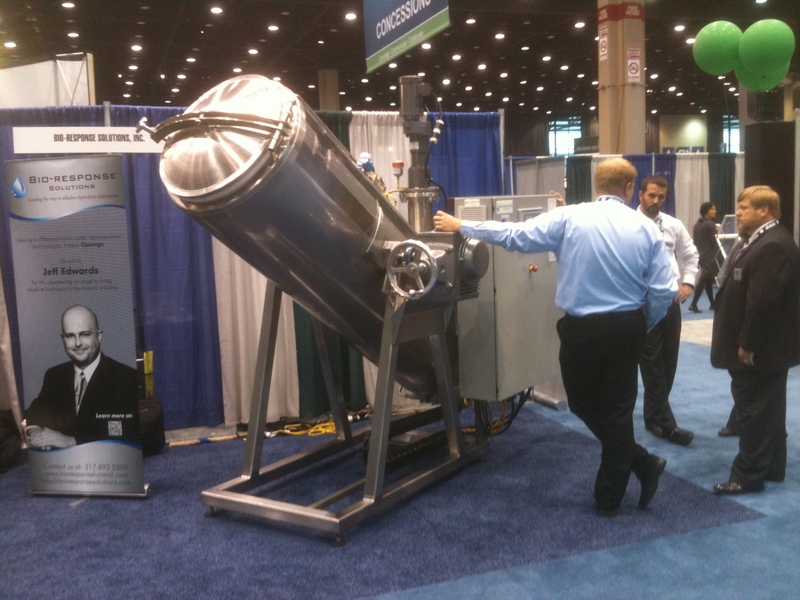 The new Alkaline Hydrolysis machine was impressive looking. I really do believe that it will become widely accepted within 10 years. By that time the price of the unit will come down and make it a viable option for cremation operators to start replacing their retorts. The one product that I really liked and will be purchasing in the near future is the large format inkjet printer offered by Lexjet at the convention. This unit and the accompanying software will allow us to make poster size photo collages for families at a reasonalble price. One of the things that families spend lots of time on is putting those boards together and then when the service is over the photos get divided back up again. With this any one that wants a copy can get them. On my next post I’ll talk about a few of the seminars I sat in on.